We are in the process of planning our first major event for Thursday, March 3. The event will take place across three cities in Canada. It is titled, the Transit Service Safari. Communication materials are being customized for each region. 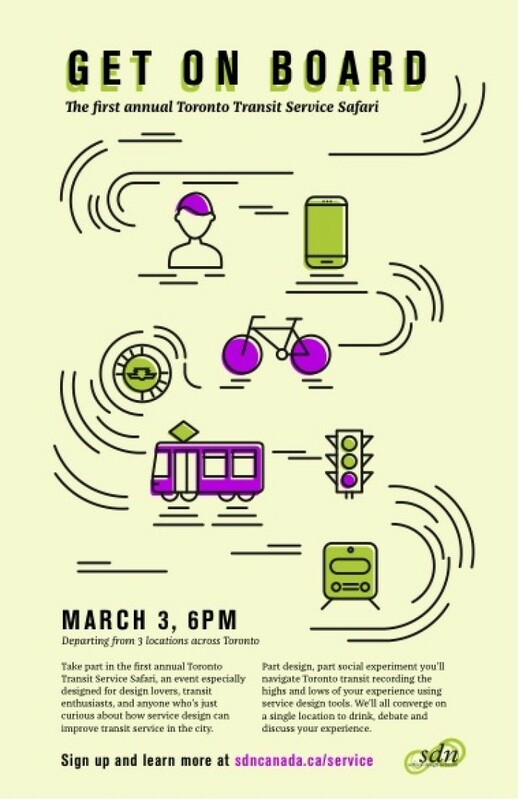 On March 3, at 6 p.m. take part in the first annual Toronto Transit Service Safari, an event especially designed for design lovers, transit enthusiasts, and anyone who’s just curious about how service design can improve transit service in the city. Under the guidance of a senior service designer, we’ll navigate Toronto transit, and record the highs and lows of our experience using service design tools. Once you arrive at the final destination, you can kick-back, have a drink, and discuss what you’ve learned with other participants. Arrive at any one of the three departure locations (see below), and look for guides holding Transit Safari Signs. Follow your guide (they’ll already have a route in mind). Document what you hear, see, and think as you navigate the service using the special template provided. Arrive at the final destination to debate, discuss and drink.